Compare at $29504 - Our Price is just $21611! This 2018 Hyundai Sonata is the best value for money mid size sedan with loads of standard fitted safety and tech options. 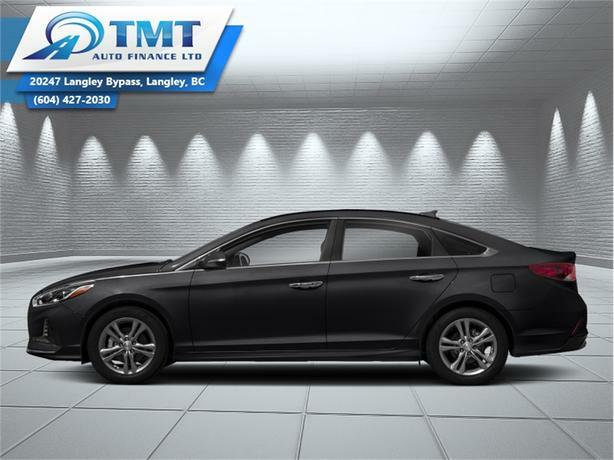 This 2018 Hyundai Sonata is for sale today in Langley. It wasn't easy to find room for improvement in the Sonata, but Hyundai managed to make their midsize sedan even better for 2018. On top of its stylish, aerodynamic new design, this Sonata is flush with technologies that keep you safer and more connected. Precision steering gives this Sonata a confident and athletic handling feel. Yet you'll discover it has the spacious comfort of a luxury car and generous cargo space. Practicality, comfort, and style all come standard in this 2018 Hyundai Sonata. It's phantom black in colour. It has an automatic transmission and is powered by a 185HP 2.4L 4 Cylinder Engine. This vehicle has been upgraded with the following features: Sunroof, Heated Seats, Bluetooth, Blind Spot Detection, Remote Keyless Entry, Collision Warning, Air Conditioning. Our Sonata's trim level is Sport. Upgrading to the Sonata Sport will let you enjoy in multiple added options such as a power sunroof with power sunshade, chrome exterior panels, power adjustable front sport seats, a sport leather steering wheel, simulated carbon fiber interior inserts, leather door trim, push button start, and remote tailgate release. Buy this vehicle now for the lowest bi-weekly payment of $140.80 with $0 down for 84 months @ 4.99% APR O.A.C. ( Plus applicable taxes - Plus applicable fees ). See dealer for details.